Percolation or filter coffee pots are the first stage of development in the preparation of coffee compared with the previous, widely spread boiling method. They were commonly used around 1817 and were from France. The hot water, heated separately in another receptacle, was poured into the coffee pot to filter (percolate) through the ground coffee contained in a fabric bag or fretworked metal basket (filter). The spirit burner, or brazier for charcoal, set at the base of the coffee pots was used to keep the drink hot. The coffee was poured into the cups through the special tap. 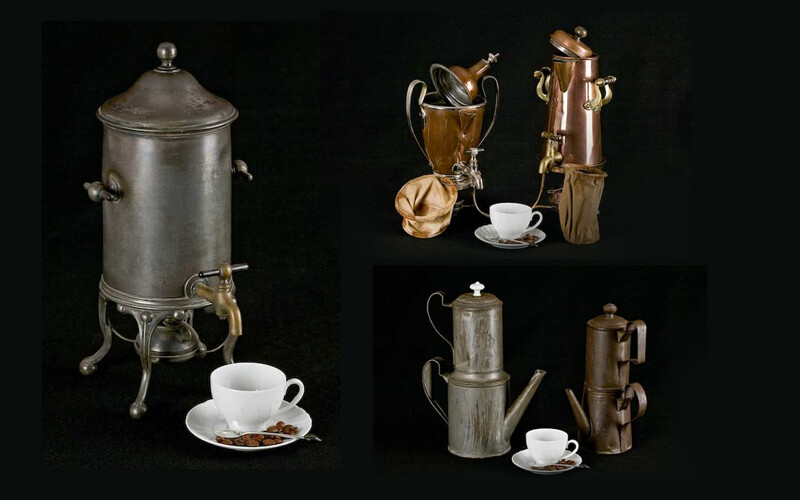 French and Italian tinplate coffee makers with ceramic or wooden knobs. This kind of coffee maker became very popular in France. The filter system prevented the coffee from boiling, as this would alter its organoleptic characteristics. Moreover, this coffee maker was easy to produce and use, and indeed could be made either in cheap tinplate or other kinds of metal or of ceramics. The coffee maker is divided into two parts: an upper part with a filter at the base, and a lower part with a spout and lid. The ground coffee was placed onto the filter in the upper part and pressed down using a pestle so that the water passed through the coffee very slowly and extracted all the aromas. When the boiling water was poured over it, the process of filtration and infusion was further delayed by the resistance of the air trapped in the part underlying the lid of the spout. When the ground coffee was entirely impregnated with water, the lid of the spout was raised or, as illustrated in one of the models, the ‘throttle’ above the filter opened and the coffee filtered into the underlying container. 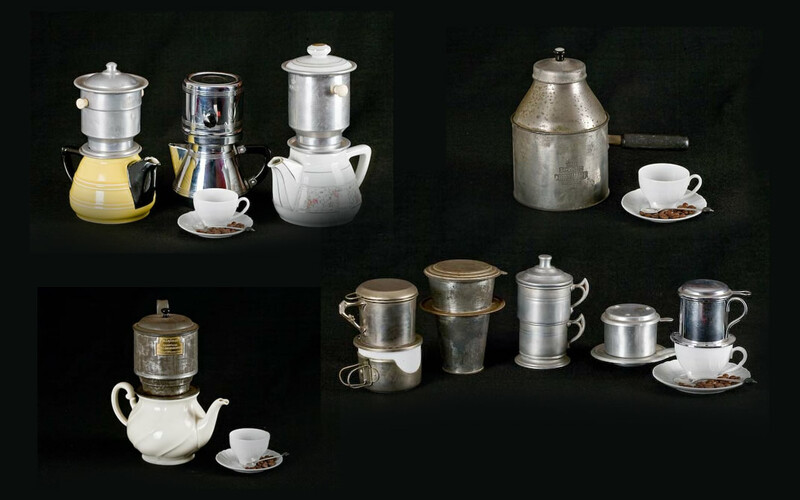 French filter coffee makers in ceramics, aluminium and chrome-plated brass. Various one-cup mini-filters produced in Germany and France. A very simple, highly practical system for making a cup of coffee without, however, much in the way of body and intensity. Also used for preparing tea and infusions. Simple tinplate filter coffee maker made in Germany bearing a brass plate with the words “Original ARNDT’SCHE Caffee – Aufgussmachine”. Four cup capacity. Once the ground coffee had been put into the special filter in this kind of coffee maker, it had to be placed over a jug and then filled with boiling water. The original instructions with the coffee pot illustrate the ways in which it could be used and declares that it made the best coffee using the least amount of ground coffee. Nickel-plated tinplate ‘The Baker’ coffee maker produced in Minneapolis, U.S.A., with an internal fabric filter held up by a metal basket. It bears the engraving of its 1902 patent although in actual fact this is the same device that was already in use in France as of the first few years of 1800.